Our Mission is to show mercy, build community, and make disciples for Christ in urban Denver. Open Door Ministries exists to provide practical help and hope to people in urban Denver who are homeless or low income. Our primary objective is to move people toward self-sufficiency by helping change the circumstances and life patterns that have held them captive to poverty and addictions. Through 18 distinct programs, we focus on tangible needs like food, shelter, access to education and employment training, as well as intangible needs such as friendship, hope, and Christian spiritual guidance. Since the issues faced by our friends tend to have many layers, Open Door has learned that the best way to help them succeed is to surround them with support, holistically empowering them to overcome obstacles, attain self-sufficiency, and thrive. Open Door Ministries has grown over the years as an extension of Open Door Fellowship Church. Open Door Fellowship was started in 1984 for the express purpose of reaching the low-income populations in the Capitol Hill neighborhood. The church has always had a desire to help people with basic needs such as housing, food, clothing, education, job opportunities, etc. With these goals, it wasn’t long before individuals in the church were starting programs to assist people in these ways. In the early 90’s, a ministry to at-risk youth developed, focusing on tutoring and mentoring. Around this time, TRYAD began as a ministry to the disabled. 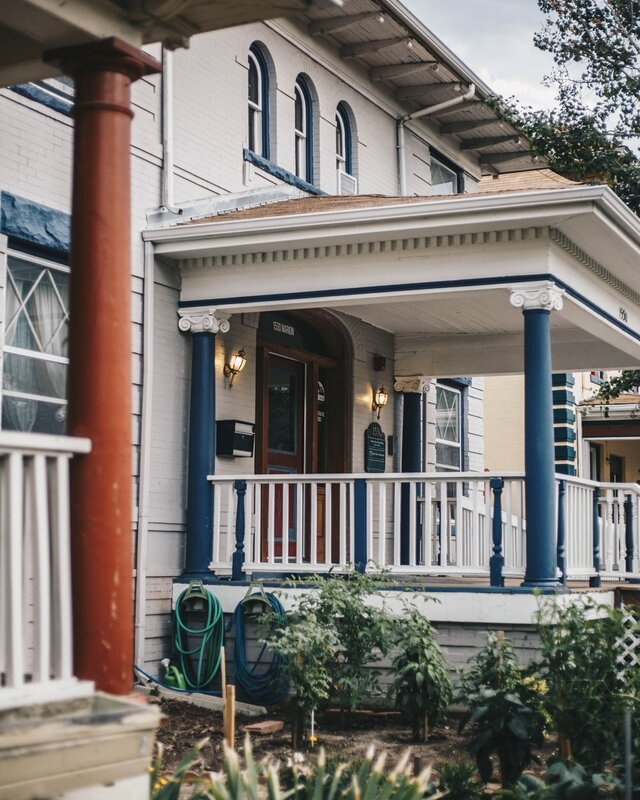 In 1996, the Treasure House, a home for single moms, and Teen House, a home for girls living on the streets, began. In 1997, we began serving a weekly meal for the neighborhood. With all of these programs starting in a grass roots fashion, the church realized it needed a structure to manage them, so in May of 1997 Open Door Ministries was created. A board was constituted in December of 1997 and the new organization received its 501c3 in 1999. Open Door Fellowship went on to plant Westside Church Internacional in January of 2018 and Open Door Ministries is now expanding programing over to Denver's Westside. Daniel currently serves as pastor at Open Door's church plant, Westside Church Internacional. Garrett has 37 years experience in the insurance industry, partnering with his brother in their second generation family agency, Dodrill Insurance. Michael has been in pastoral ministry since 1989 and currently serves as the Lead Pastor of ChristLife Community Church. Karla is a retired teacher from Jefferson County Schools. Stefan currently serves as the Denver Campus Pastor for Flatirons Community Church. Mike is retired from a 27-year career with Johns Manville Corporation and heads up the missions committee at Bethany Evangelical Free Church. Stephanie is the Senior Director of corporate strategy at DaVita in Denver and attends Waterstone Community Church. Jarrod currently serves as Administrative Pastor at Open Door Fellowship Church. Carol is retired after a 30+ year career as a real estate broker with RE/MAX and is actively involved at Southeast Christian Church. Dan worked for 10+ years in finance and real estate and now serves as the Director of the Ministry Residency Program at Denver Seminary. Don is an Application Architect with Hewlett Packard. Jeremy is a partner at Denver-based law firm Wheeler Trigg O’Donnell, practicing in the areas of insurance coverage and business litigation. Dave currently serves as Executive Pastor of Ministries at Crossroads Community Church in Parker. Danielle, our Board Chairperson, is the Ministries Pastor at Waterstone Community Church. Cassie works as a Learning Systems Coordinator at a manufacturing facility with a focus on emotional intelligence training. Kim is the Business Director for Open Door Ministries and has been on staff since our inception in 1997. Mercy currently serves as the Co-Director of Project I See You, a ministry that is partnering with ODM to start Te Veo House. David is the Executive Director of Open Door Ministries and has been on staff since our inception in 1997.